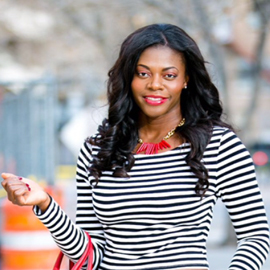 Hello Yvonne: Stripes for Work! "There is no substitute for hard work" Skirt-Express (Similar, Similar), Shirt- H&M (Similar), Bag- Phillip Lim (Here), Heels/old- Forever 21 (Similar). Hello and hope your week is going well. Mine has been great as I'd shared on instagram stories that my parents visited for thanksgiving and it was lovely. The one thing my parents have always showed me and continue to show me besides love is hard work. I acknowledge I've been blessed with their contribution in getting me where I am today but I'm always reminded of the importance of working hard, being independent and not having to rely on anyone. I'll share what drives me on the next post. Speaking of hard work, I chose to share a work inspired look today with the pencil skirt and button down shirt which I think are always appropriate for work as long as they're not too tight. I added the striped heels to match the striped shirt and a big bag that's great for work. Although this is a work look, the pieces can also be dressed differently for an outing. As always, thanks for visiting! A Tie Front Dress & Loafers!